If you start making AVs, having come from a background in photography, the whole area of sound may be new to you. Adding some pictures to a music track is often the way to start, but after a while you might want to add some narration to introduce the sequence or to explain what is happening. Recording the narration ought to be simple, but using an inexpensive microphones plugged into the microphone socket of the computer is unlikely to produce the quality you want. The longer term solution is to purchase a microphone pre-amplifier and a quality microphone. Gradually you can then build up a collection of sound equipment. Starting price will be about the same as the cost of a lens for your camera. However, in the first instance, you might want an inexpensive start. 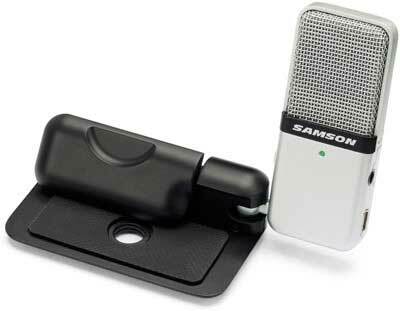 The Samson Go Mic could be such a start, though you should recognise that there is no upgrade path from this microphone, if you want better quality than it can provide, you will have to throw it away and start anew. But for around £35 this microphone will give you a start and with good microphone technique on your part, a narration quality which is very acceptable. The microphone is small and light, though the 'base' is heavy enough to keep it firmly on your desk. This base also includes a clip which can be used to hold the microphone to the top of the laptop screen (not a location that I would recommend, due to increased noise). For storage the microphone folds under this clip and into a neat case. The base also has a screw thread, but this is a microphone-stand thread, not tripod thread! See the Samson Website for a lot more detail. The microphone connects to the computer by a supplied USB cable. Both PCs and Macs will recognise the microphone without the need to install drivers. The enclosed documentation makes it simple to ensure that you route the mic signal to your chosen sound recording software (probably you are using Audacity to edit your sound tracks and this software will also allow you to record straight from the Go Mic). The mic can be switched from omnidirectional sound sensitivity (as you will guess, sound from any direction is recorded equally loudly), to cardioid sensitivity where sounds from in front of the mic are recorded very much louder than those from the sides and behind. This is useful as it allows you to place any extraneous sources of noise, such as the laptop and it's noisy fan, behind the microphone (and as far away as is practical). I recorded the tests with the mic about 20cm (a handspan) from my mouth and with it pointing to my mouth but to one side. This reduces the effect of explosive sounds, e.g. 'p's and 'b's, from overloading the mic. The two samples are from the Go Mic plugged into a laptop computer and from a Senheisser K6/ME64 (£300 semi-professional mic) plugged into an Edirol R09 digital recorder. I bought mine online from www.dv247.com , currently their price is around £44 including shipping, though you might find it a little cheaper elsewhere if you search the web.